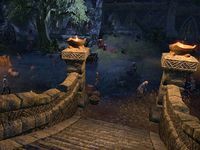 The crypts and catacombs beneath the Serk graveyard have been turned into the headquarters for the Maulborn quarantine. Here, the Maulborn supposedly develop a curative for the Llodos plague ravaging Deshaan. Serkamora, more commonly known as Quarantine Serk, is a small village in western Deshaan, just north of the town of Narsis. The village is under quarantine due to an outbreak of a deadly plague. 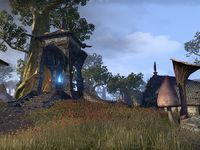 The Maulborn have taken over part of the village, as well as the village catacombs, and claim to be developing a cure. Several of the local townspeople are suspicious, however, and will ask you to investigate the Maulborn encampment. Quarantine Serk Objective: Discover the truth behind the Maulborn curative. Bad Medicine: Discover the source of the Llodos Plague. Proprietary Formula: Collect samples of the Maulborn curative. Quest For the Cure: Create a real cure for the Llodos Plague. The Llodos Plague: Alert the Narsis guard to the Maulborn plot. 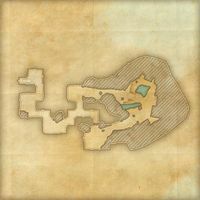 Quarantine Serk Wayshrine is located just north of the village, near the Stonefalls gate. It is marked as discovered the first time you enter Deshaan by any means. This page was last modified on 12 March 2019, at 19:34.